Bye, bye, BBM! 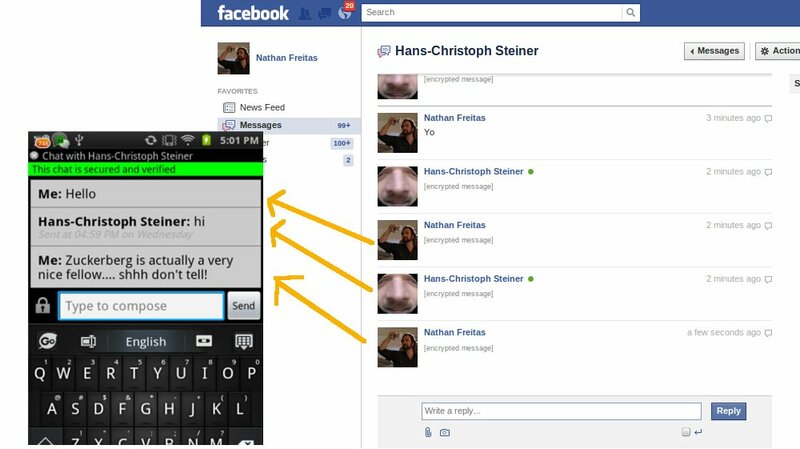 Facebook Allows Verifiable Encrypted Mobile Messaging for Android and iOS; Mobile Revenue Threatened? Yes, yes, we are trying to get in on all of the Facebook pre-IPO buzz. Fortunately, the headline is true – through Facebook’s support for open-standards messaging, our secure mobile messaging app, Gibberbot for Android, can be used to communicate securely with any other friend on Facebook who is ALSO using a secure messaging app. Whether it is Gibberbot, ChatSecure for iOS, Adium (Mac), Pidgin (Windows/Linux), or one of the many secure messaging apps that support the Off-the-Record encryption capability, Facebook allows encrypted messaging between mobile and desktops alike. This means that as opposed to the default Facebook Messenger apps that transmit and store their messages in plaintext, no one but you and the person you are messaging can read the contents of the communication. This goes far beyond the really unsafe designs of group messaging products like WhatsApp, which have pretty much no security at all, and are easily hijacked and monitored. You can even use Gibberbot over the Tor network, to access Facebook messaging in places where it might be blocked or monitored, like your school, work, or your local authoritarian surveillance state. Now, it is very interesting to note, that while they allow it, they do *detect* that you are using encryption, and tag it as such in the web-based messaging interface (which does NOT support encryption). Only time will tell if this is simply a feature for tidying up the user interface (else you see a bunch of cypher text gobblyegook), or some sort of retro-future surveillance of who is using Facebook in non mainstream ways. After all, if Facebook cannot index my chats for keywords to advertise against, do they really want me using up their server computing time? Below is a screenshot of ChatSecure, the first open-source secure messenger for iOS devices. We are excited to be partnering this project to ensure full interoperability with Gibberbot. Learn more about the entire Guardian Project suite of open-source secure mobile apps. ..Can I use my BBM ping on bibberbot? ..How can I add my BBM on gibberbot? ..Can I use my blackberry plan on gibberbot.if yes.how? BBM is a closed, proprietary service. We cannot support it. Gibberbot allows you to chat via your Gmail, Facebook or Jabber account. You can connect to any other person also using Gibberbot, ChatSecure for iOS, or Pidgin, Adium or Jitsi on the desktop. now to rescue them from Facebook and TWIT*r.
Now I don’t have any additional information of server, or port (Every “Advanced Settings” inputs). In Facebook Messenger is worse. I don’t have any information of how to connect. For facebook, you just enter your Facebook page/username @facebook.com so. and Gibberbot will figure everything else out. Currently, we do not support WhatsApp because they have a proprietary version of the protocol. Does Gibberbot/Chatsecure have a functionality to support *group* messaging? The desirable features of apps like Whatsapp/Viber is the ability to send *group* chats. Is this possible with Gibberbot/Chatsecure? Yes ChatSecure has group messaging capability, but the user interface for it is still quite minimal. This will be a big focus in our v14 release. If i use the Gibberbot to chat with someone, do they have to have it too for the chat to be private? Both users need an app on mobile or desktop that supports OTR Encryption, such as Pidgin, Adium, ChatSecure, or others.